A native from Maine to Florida, these broadleaf evergreens intrigue but also sometimes frustrate the home gardener. 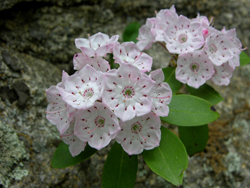 With so many magnificent specimens growing wild in the eastern forests, why is it sometimes difficult to grow mountain laurel in the landscape? First, you will need to choose the right site. Mountain laurel will tolerate sun if there is adequate moisture and the root area is cool, but partial shade is preferable and shade will do if there is some morning sun available. Plant your mountain laurel where it has plenty of room to grow to maturity; it should not need to be pruned except to remove dead or damaged wood. Mountain laurels are slow-growing, reaching 4-8 feet over 10 years. This contributes to their irregular habit, creating an elegant specimen. 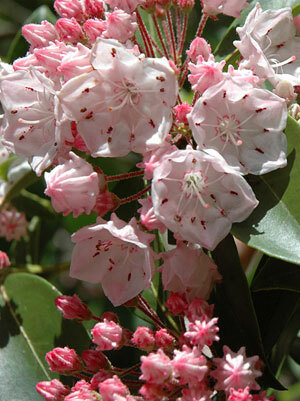 As a member of the heath family, which includes rhododendron, mountain laurel requires well-drained, rich, acidic soil. Replicate these conditions and your plant should thrive. Your soil pH should be 5.0-5.5, but if your pH is higher than 6.5 your mountain laurel may not survive and certainly will not thrive. Laurels seem to perform best in raised beds, heavily amended with sphagnum peat moss or finely ground pine bark. To plant, dig a hole three times as wide as the root ball. Set the plant at or above the depth as it was growing in its container or the size of the root ball. Do not plant it more deeply. Mix a handful of superphosphate to the amended planting soil, then backfill the hole and water thoroughly. Add a 3-inch layer of pine bark mulch to keep the roots cool in hot weather and to retain soil moisture. Check plant often throughout the season and water before soil dries out. Fertilize twice yearly with Holly-tone; once in the spring and half strength in the autumn to provide adequate nourishment. Alpine Pink – Rich pink buds open to medium pink with a white throat. Carousel – Starburst pattern inside the corolla. Good growth. Hearts of Fire – Red buds open to a deep pink flower. Nipmuck – Intense red buds open cream white to light pink while the back of the corolla is dark pink. Olympic Fire – Large deep red buds open to pink flowers. Pinwheel – Maroon flowers edged in white with a cinnamon-maroon band that almost fills the center of the corolla. Snowdrift – Compact, mounded plant with pure white flowers. Elf – White flowers on a dwarf plant. 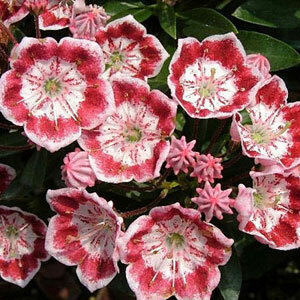 Mountain laurels can be magnificent specimens to add to your landscape, try one today!